Users may use EDP Professional to export EDDs. Running exports within EDP requires both the import and export formats to be installed and licensed (a license of the export does not necessarily imply a license for the import). 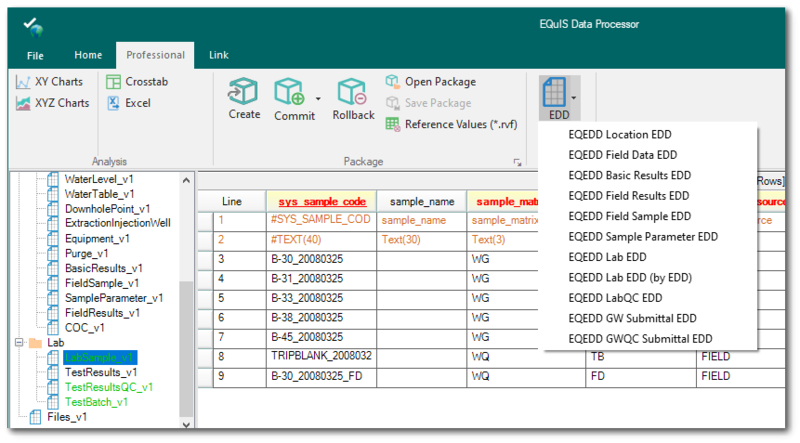 Note: EQuIS Professional users now have the ability to import and export data in the EIM format in Professional EDP. 1.Start EQuIS Professional and connect to the desired database and facility. 2.Click on the EDP button to open EDP. 3.Open the desired format file. 4.Click on the Pro tab in EDP. 5.Click the EDD button in the Export group on the Pro tab. 6.Choose from the list of EDD exports. 7.Select the desired input parameters. 8.Click the green Go button to run the report. 9.Review the data in the appropriate sections of the EDD. 10.Use EDP to save the EDD in desired file format. The Office Hour video EDP Exports can be viewed on YouTube or from the EarthSoft Office Hours Videos webpage.